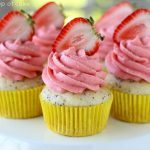 Light and fluffy strawberry whipped cream tops these strawberry swirl cupcakes to make Strawberries and Cream Cupcakes perfect for pink parties! 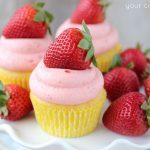 I love strawberries and cream! 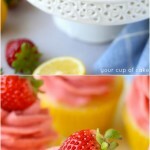 It’s hard to translate those flavors and textures into a cupcake but to do it I used my Strawberry Whipped Cream! It’s light and fluffy and perfectly pink! Using this as a frosting is great for people who don’t like traditional frostings or anything overly sweet. 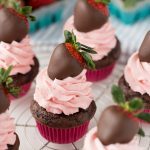 You don’t even have to sweeten the whipped cream! 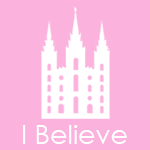 Pink, pink, pink. I still remember my hot pink room I had when I was 4. I felt like a total princess! It gave my parents a head ache to be in there because it was neon but they were happy to paint it for me. My mother said years later “It was just a few walls and some paint and it made you the happiest little girl.” My entire closet was full of pink too. I wore pink spandex shorts with mismatched pink shirts and my high top Converse. I was one classy little girl, haha! 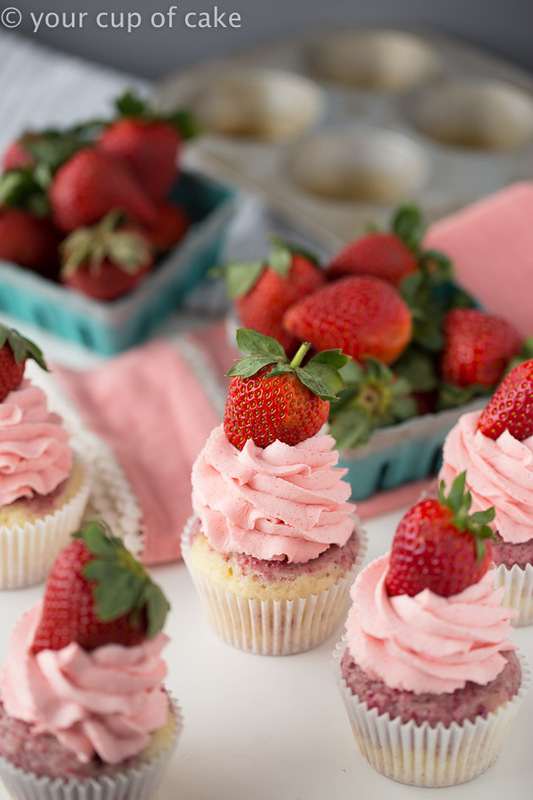 These cupcakes would have been my dream! 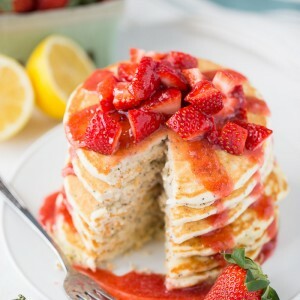 You can make the batter swirled with pink or mix the strawberries through the whole batter. 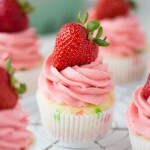 I always tell people who want to decorate cupcakes like a pro that they should top their cupcakes off with fresh fruit. 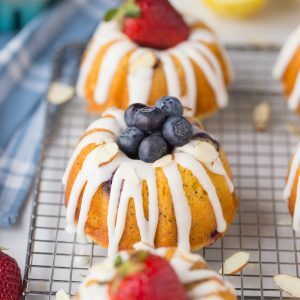 It always makes them look for decadent and it helps to cover up any flaws in the piping. 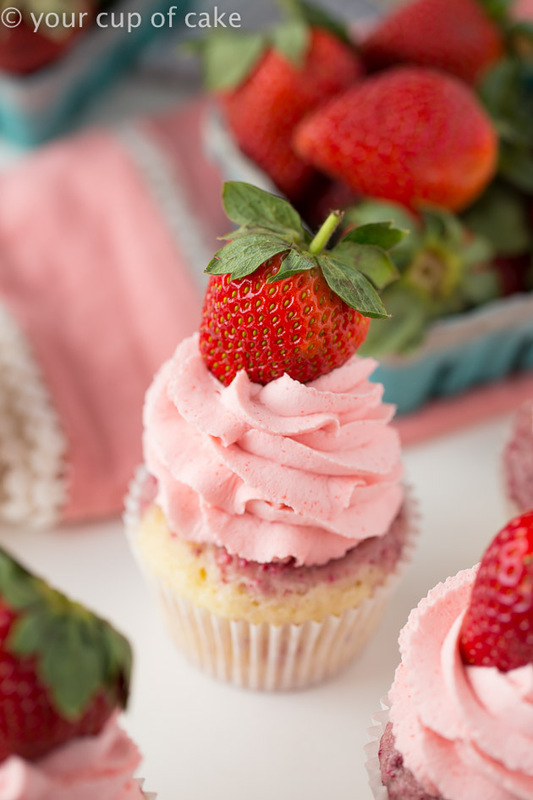 Sprinkles can also help but fresh fruit on top or candy pieces are the best! And as always, my favorite cupcake pan is shallower than normal pans so you never get that ugly dark rim around your white/yellow cupcakes! 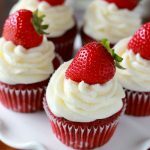 Enjoy my Strawberries and Cream Cupcakes for Valentine’s Day, bridal showers or any summer party! 1. Preheat oven to 350 degrees and line a pan with 20 cupcake liners. 2. 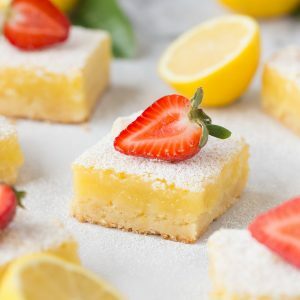 Combine cake mix, eggs, oil, buttermilk and sour cream. 3. 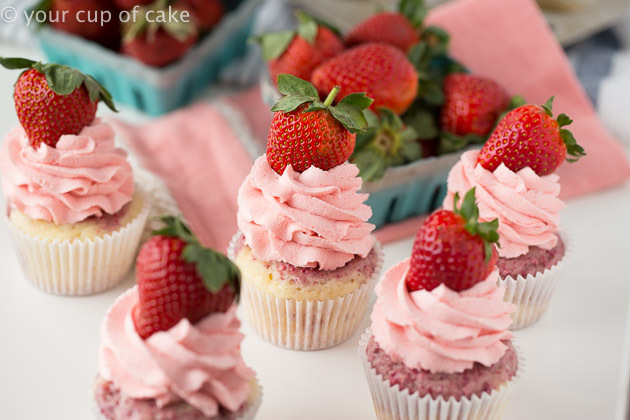 Use half of the batter to evenly distribute among the 20 cupcake liners. 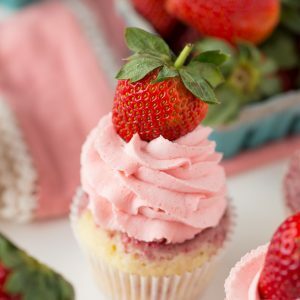 Add your freeze dried strawberries (I buy mine from Trader Joe's and I crush them before using) or your strawberry puree to the remaining batter and stir well. 4. 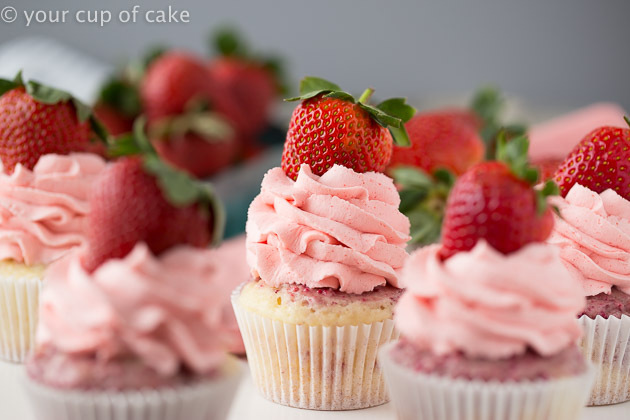 Add the rest of the batter to your cupcake liners and use a toothpick to swirl. 5. 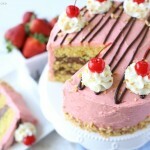 Let cool and top with Strawberry Whipped Cream! 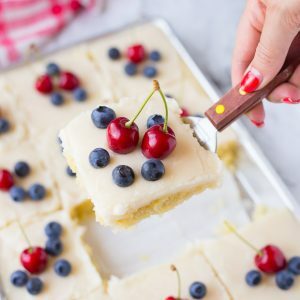 Just wanted to let you know there’s no baking time listed on this recipe! 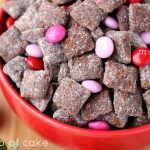 What size package of freeze-dried strawberries do you use? What is the baking time? 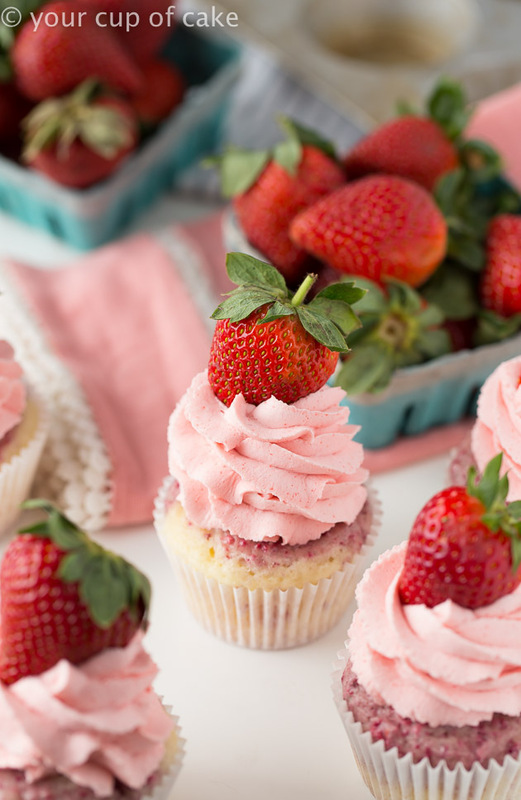 We don’t have strawberry whipped cream around here. Any suggestions?